Today instead of the usual SEOchat Q&A post, we have a special edition of SEOchat cool SEO tool column to feature our cool somewhat updated search result comparison tool: Google, Bing, Blekko search engine comparison tool! Wait for the tool to retrieve the top 50 search results and lay out them for you. Easily see how search results overlap! Cool and fun visualization. 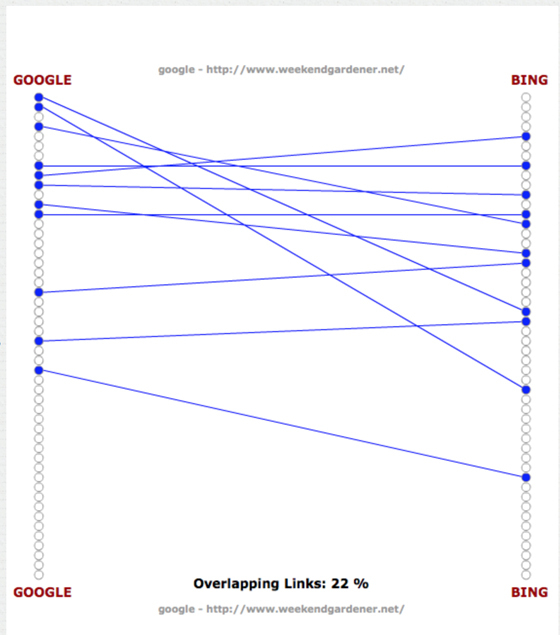 Now go play with the tool: Google, Bing, Blekko search engine comparison tool! It doesn’t seem to be working with Google. Bing appears to be working though. This may seem like a silly question but is having crossing links bad? Does Google see this as being duplicate content? I am just trying to understand the usefulness of this tool. If we have results that cross does this matter? Very helpful article. Thx Ann!